This post is short and sweet. Am sharing with you these rolls I baked mid-week. I hope you enjoy them. Great for any occasion. They freeze really well after cooling off and reheat wrapped with foil at a 350F preheated oven for 10-15 minutes. In a mixer bowl add the water and the yeast. Mix with a spoon. Attach a kneading hook to the mixer, a.dd the flour and the egg to the yeast and start kneading on low/medium speed. Immediately after starting to knead, add the salt, honey, oil, cheeses and scallions. Knead for 4 minutes on low/medium and 6 minutes on medium/high until all ingredients are incorporated into a smooth and elastic dough. Cover with a plastic wrap and let rise for an hour in a warm spot on the counter. Remove dough to a working surface and punch bubbles out. Divide dough to 16 equal parts and roll each dough into a smooth ball. Layer a cookie sheet with parchment paper and flatten each dough with the palm of your hand on the cookie sheet. Space the rolls a couple inches apart. Cover with a kitchen towel and let rise for 30 minutes in a warm place. Snip each roll with kitchen shears or a knife as seen in photo to create the wheat design. Whip the second egg with a fork, brush the rolls with the egg wash, sprinkle with sesame seeds and bake for approximately 25 minutes until tops are golden. Ovens vary. Original recipe called for 12-15 minutes at a 350F preheated oven. Oh I love the idea of making a huge batch of these and having them frozen, ready to go! For breakfast, slice them open with a little egg and more cheese? Yes please! I know, right?! It saved us when we wanted to put a last minute meal together. Totally wish to have lunch with it the way you described it Nelly. TY! These rolls look lovely! Can't go wrong with that pairing! I know, right?! Thx Bri. Though normally I wouldn't pair feta with parmesan but in this recipe really you can use any cheese you got. Just beautiful, and love the flavors! TY so much. In a surprising way the flavor is delicate, really sublime! I wish I could send you some, Lora. Thank you!! The dough oh shucks forgot to include that snapshot will correct it now. Wow, these are gorgeous, Shulie! The shape of these is so unique...I love them! TY Lizzy. Supposed to be wheat shaped. Came out close enough. lol I thought it was fun to change the shape around. They are so pretty and must taste just wonderful! A great combination of flavors. TY Rosa. You are always so lovely and gracious! Looks amazing!Wonder whether this would work with small red onions? I love the shapes of these, and feta and Parmesan sounds delicious! The recipe looks so manageable, even for those of us who are a little yeast phobic (for fear of failure). I love the savory twist. Can't wait to bake 'em and pair with some fresh greens from my farmers' market. Beautiful Shulie! These rolls really look incredible. You did a fabulous job. I love the filling too! 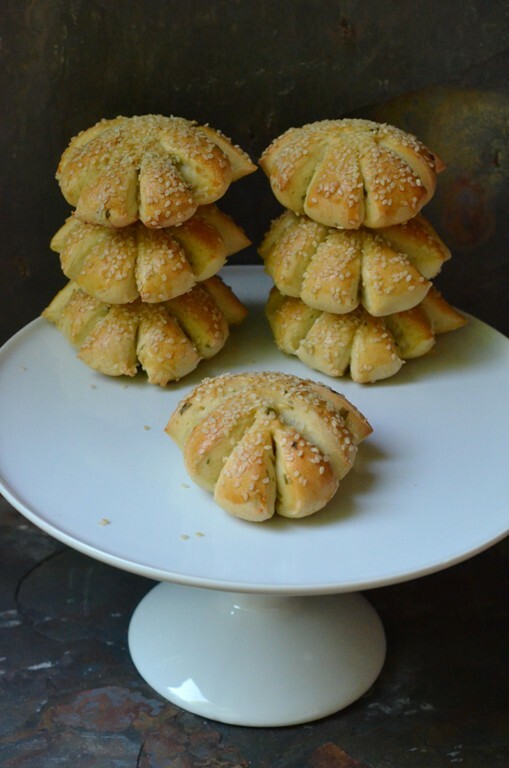 feta and scallion buns! I am happy!! Making these soon Shullie! 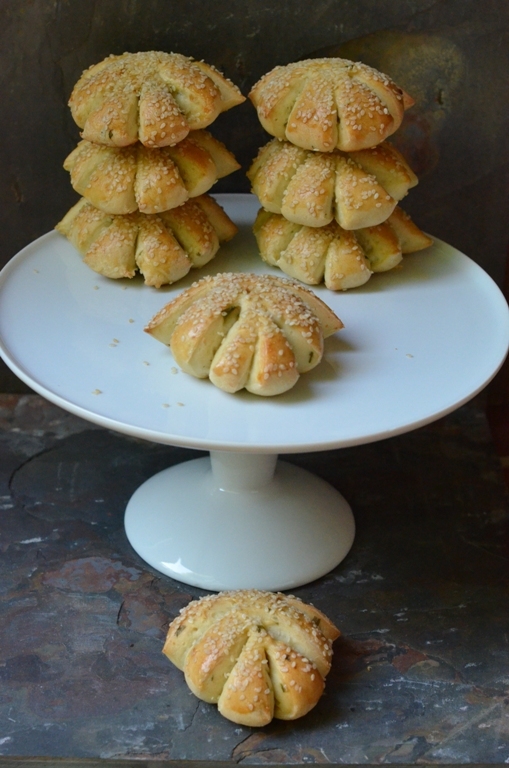 What a great idea, make a big batch of these yummy rolls and always have fresh homemade bread on hand. How in the world did I miss these!! Oh my heavens...swoon. Shulie - these look great!